It's annoying enough to have to endure advertisements while you watch TV, surf the internet and drive in your car. But imagine standing in front of a bathroom vanity being forced to wait for a video advertisement to play before you can check your reflection to see if there's food in your teeth or if your makeup needs retouching. Sound unrealistic? Think again. According to the Los Angeles Times, one company has not only thought about mirror advertising, but has been putting them into bathrooms in Tel Aviv, Israel, with plans to install more in a mall in northern France. Novo Ad has developed the technology to turn an ordinary bathroom mirror into a moving, talking display that they hope will grab the attention of bathroom-goers. The mirrors are actually LED screens with an internal hard disk and "very sophisticated proprietary software," a spokesman for the company said. 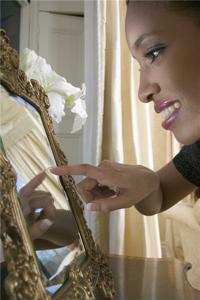 To demonstrate how the advertisements will work, the company released a video in which a woman walks up to the mirror, which is taken up entirely by a picture. As she gets closer, the video starts to play and the size of the advertisement shrinks so the woman can still see her reflection. She then starts brushing her hair as she ponders the advertisement. According to the company's website, they have plans to install these LED mirrors in shopping malls, exhibition centers, department stores, airports, hotels, train stations and cinemas all over the world. The Los Angeles Times reports that the French mall that plans to use the mirrors will aim to play advertisements for itself and the stores in the mall, and deodorant companies and a prominent skincare company have already shown interest in advertising on the mirrors. Device Magazine points out that because the ads are in such a prime spot that many consumers will have no choice but to look at, the videos themselves don't have to be as bright and catchy as other ads, like those on buildings or on television. If you're interested in seeing these mirrors for yourself, you may have to wait awhile. Novo Ad's plans to spread into the U.S. are still in the works. "We are looking for advertising networks and partners in the USA," said Steven Harris, a spokesman for the company, "and would like to be there as soon as possible." Enjoy your ad-free mirrors in public places while you still can!